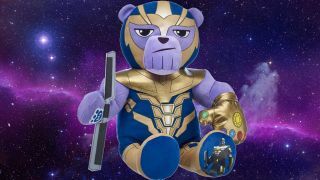 A Thanos teddy bear might have ruined Avengers: Endgame for everyone because, sure, why not? Is this Avengers: Endgame toy the cuddliest spoiler ever? Now, this is a sentence I never thought I’d have to type: One of the biggest twists in Avengers: Endgame has potentially been spoiled by the cutest, most-huggable Thanos teddy bear. No, I’m not making this up. I absolutely wish I was but, trust me, it’s not April 1. Of course, possible spoilers are below but, come on, you can’t say no to the Cute Titan now, can you? Look at his face! So, if you head on over to the Build-A-Bear website, you’ll come across this exclusive Thanos bear (H/T r/MarvelStudiosSpoilers), complete with adorable little Infinity Gauntlet mitten. Wiping out half the universe has never been so darned adorable, let me tell you. But it’s the teddy’s voice clips that might stop you in your tracks more than anything. There are five main quotes, which range from the menacingly generic (“I don’t care for your petty politics”) to the possible spoilerrific: “I had all the power in my grasp” and “How are you doing this? You do not have the power to wield the Infinity Stones” which sure sound like big ol’ plot points from the upcoming Endgame to me. There’s even official art from Endgame on the bear’s boot, just in case you weren’t sure about its authenticity. We have so many questions. So. Many. Questions. Thanos had a crispy Gauntlet the last time we saw him in Avengers: Infinity War, which partly explains away how he lost his power, but who’s making a grab for the Infinity Stones? This could be all part of the Earth’s Mightiest Heroes’ grand plan to undo the snap and put things back as they were – and it’s been spoiled by a bloody teddy bear. If we’re keen to get our tinfoil hats on, it might even confirm time travel as a means of swiping the first Gauntlet or grabbing a second one somehow through time-wimey madcap methods. Teddy Thanos sure sounds angry over having something (i.e. the Infinity Gauntlet) in his hands only for it to slip away out of nowhere. If someone else is controlling the Infinity Stones, or a duplicate of them, then that spells trouble for the Mad Titan. Of course, we could be looking way too much into a teddy bear. Or it could be everything. Either way, it goes to show the lengths that people are taking just to find out a little bit extra about the most hotly-anticipated movie ever. …And that’s the last time we’ll ever analyse a stuffed toy’s voice clips. Promise. Want to look beyond Endgame? Check out the best new Marvel movies or watch our round-up of some of the best flicks coming your way in 2019 below.